Toast your clients with an elegant 1oz. 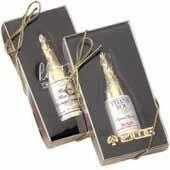 chocolate champagne bottles, foil-wrapped and labeled. Wrappers available in Gold and Silver. Tray available in Black. Stock labels available: Congratulations, Happy Birthday, Thank You, Brijon, Season's Greetings, Happy Valentine's Day, Happy Secretary's Day and Happy New Year. Bulk packaging. 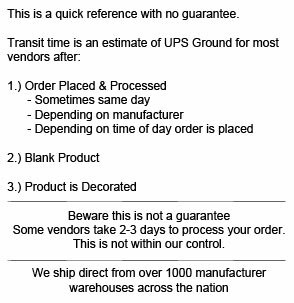 Size: 2 5/8" W x 5 1/8" H Max Imprint Area: Box - 2" W x 1 1/2" H Warm Weather Shipment: Chocolate products may be damaged by heat during transportation. For larger shipments refrigerated trucking is available. Large insulated cartons are available with ice packs for $25 each. For climates over 65 degrees, we recommend shipping chocolate in 8 lb insulated coolers with ice and a 2-3 day delivery time. Over 80 degrees, we recommend 1-2 day delivery times. 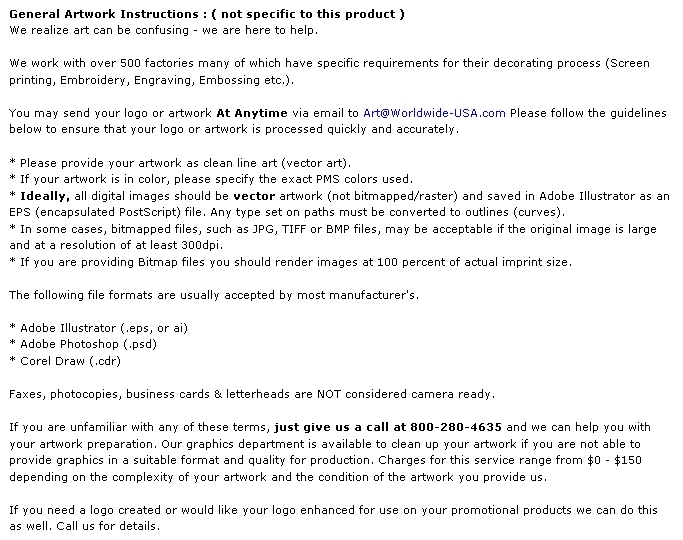 If you place an order we will email you with shipping charges incurred during warm weather months. WT_100: 00 LBS. 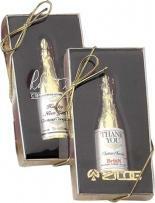 Buy Chocolate Champagne Bottle (1oz) Today!